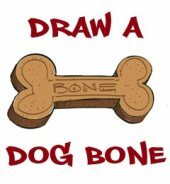 You can draw a cartoon dog bone! 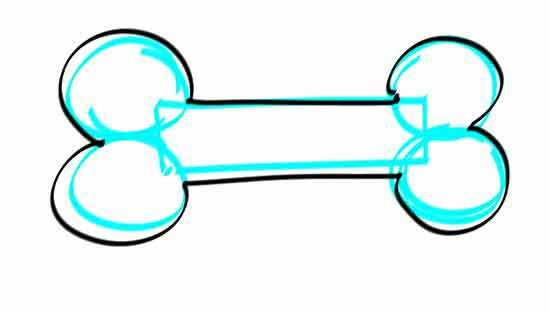 Learn how to draw a dog bone by following the simple steps below. 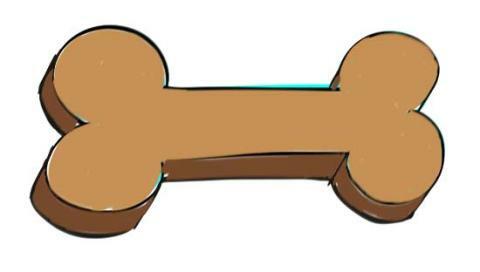 Shade your dog bone drawing to make a look 3D and then show it to your dog and see what he thinks! This could give a whole knew meaning to "My dog ate my homework." If your dog did eat your drawing, it would be a real compliment to it's quality and your talent! Unfortunately you wouldn't have anything left to show for it after Fido gobbled it up. Seriously though, this is a great lesson to train your talent as an artist by practicing how to draw with shapes and can help you to learn to draw in 3D. A dog bone is a pretty straight forward object to draw. It is basically a rectangle with a pair of circles on each end. This one should be easy for you to bite off! 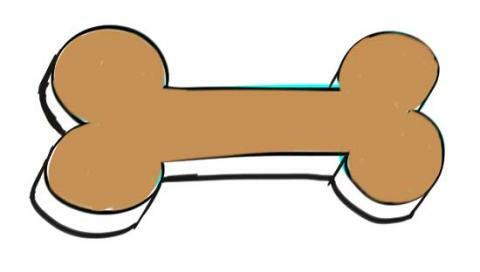 Now get started with "How to Draw a Dog Bone! Draw two circles at each end of the rectangle and let them overlap each other as shown. 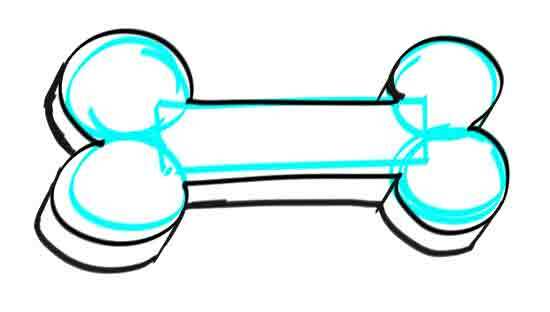 Outline your dog bone drawing with a dark marker, pen or dark pencil. Let's add some dimension to our dog bone drawing. Begin by drawing short diagonal lines from the corners and edges of the bone to give your drawing depth. The art word for this is "Perspective." Complete the back of the bone.by connecting the back edges of the bone as shown. If you haven't already erased your guide shapes, this would be a good time to do so. Once you are done erasing, go ahead and color in your bone. Color the side of your bone darker than the top. This shading helps give your bone depth, making it look 3D. Here's your chance to personalize your drawing. Try adding your dog's name or the the word "Bone" to your masterpiece. You can also add some details to the top of your bone as shown. With a darker color, and more shading lines to the dark edge of the bone. Now look over your drawing carefully and consider what else you may want to add to perfect your drawing. If your satisfied, you an call it done! 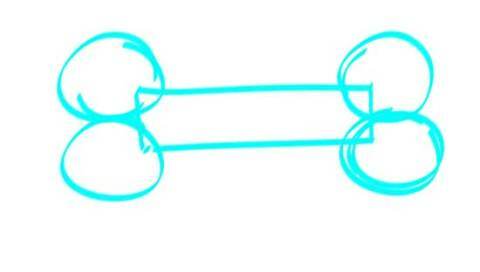 Congratulations you have finished this step by step online drawing lesson, "How to Draw a Dog Bone!" Dog bones make great treats for your pet plus they help keep your dogs teeth clean. You can even buy some that are shaped like a tooth brush. There are special dental bones designed specifically for keeping teeth and gums healthy. They also come in a variety flavors.. Chicken beef, fish, chocolate, you name it. I recently visited the pet store and found a buffet of dog treats. In addition to dog bones, they had dog cookies. These dog treats looked good enough to eat myself, especially the chocolate chip looking ones. Dog bones come in various sizes. You can make a funny drawing by drawing a small dog with a very big bone in his mouth or a really big dog with a tiny bone. Dogs have a natural desire to chew on things and dog bones help to satisfy that desire. It gives your dog something safe to chew on other than your Dad's favorite shoes or your favorite toy superhero. My neighbor has a puppy named Conrad. Conrad loves to chew on things. He comes over to our house and takes things. My kids have already lost a couple of shoes. Conrad took a broom and a mop from our back porch and even ran off with a postal package. It contained my wife's new swimsuit. Unfortunately it had a few extra holes in it thanks to Conrad's dog gone chewing habit. Fortunately Conrad's owner is a nice man and he offered to pay for a new swim suit and despite his bad habits we like Conrad very much because he is a happy and funny dog. That dog needs some dog bones to chew on! Hungry for more dog stuff to draw and make? 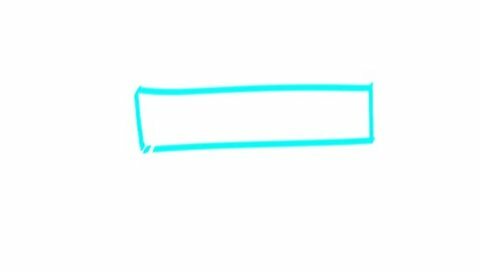 Here are some reference images for how to draw a dog bone on Google images and we found some cool dog crafts too that might be fun to make.